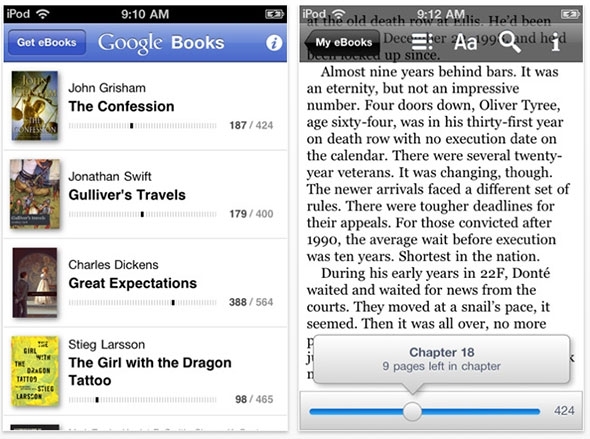 "Google Books for iOS was introduced late last year and opened the world of Google's 2 million digital books to iOS owners. The application competed with Apple's iBooks and Amazon's Kindle application, but it lacked the polish and finesse of these two applications." With this version, Google Books hopes to add in some of that finesse and polish that has been missing. Now you can read in landscape mode as well as search for a specific word or phrase. You can also download e-books using your Google account once you have linked it to this app. It's a free universal app and available now in iTunes, but I'm still pretty happy with my Kindle and iBook apps, what are your thoughts? Anyone use this app much, if at all?